Fans of Doctor Who will be able to catch exclusive footage of the latest series when a roadshow visits the Swansea Big Screen over Easter. The BBC roadshow lands at the Big Screen in Castle Square on Thursday, 1 April. The Easter weekend extravaganza which will run until Saturday, 3 April from 1100 until 1600 GMT. Fans will be able to see exclusive footage from the new series starring Matt Smith as the 11th doctor. There will be the chance to see the Doctor Who trailer in 3D and fans can also get their photo taken tumbling through the giant vortex. The first TV show featuring the new Doctor Who is screened on Easter Saturday. Graham Thomas, Swansea Council's cabinet member for culture, recreation and tourism, said: "Swansea has close links with Doctor Who and I'm sure people will make the most of this opportunity to catch the latest trailer on Castle Square's Big Screen and take part in the other fun activities. "The programme has the ability to spark the imagination of people of all ages and millions of fans across the UK will be looking forward to the new series. "This is another example of how the Big Screen is continually bringing cutting-edge fun and excitement to Swansea city centre." Similar Big Screen Doctor Who events are being held in London, Manchester, Edinburgh, Plymouth. 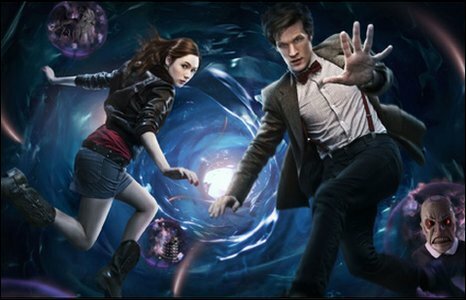 Before they take place, the new doctor Matt Smith will go on a nationwide tour with his companion Karen Gillan. They will travel to Belfast on the 29 March, and then go to her home town, Inverness, for a screening on 30 March. The bus will then move on to Sunderland that afternoon and Salford on Wednesday 31 before finishing later that day in Northampton - Matt Smith's hometown. Alec McGivan, head of BBC Outreach, added: "Outreach is all about getting face to face with people so they can get involved and experience the BBC in a different and exciting way - we're delighted to be able to take one of the BBC's best loved brands out to its audience."